Drivers have begun flocking toward hybrid cars in recent years. It makes sense, as hybrid vehicles can provide all the luxuries of regular vehicles with the added bonus of better efficiency and an eco-friendly factor. Still, it can be a little difficult to navigate the hybrid vehicle landscape to find one that ticks all of the boxes. Watch as we compare the 2017 Honda Accord Hybrid to the 2017 Toyota Camry Hybrid to find out which of these vehicles is the better deal. Another important area when the 2017 Toyota Camry Hybrid finds itself falling behind is in the amount of available space it can provide. The Camry Hybrid only provides a maximum cargo volume of 13.1 cubic feet, 41.6 inches of front legroom, and 58 inches of shoulder room. On the other hand, the Accord Hybrid is able to provide a bit more breathing room with 13.7 cubic feet of maximum cargo space, 42.2 inches of front legroom, and 58.9 inches of front shoulder room. While they may not seem like large discrepancies, the extra inch or two definitely plays a part in increasing passengers’ overall comfort levels. Ready to Test Drive the 2017 Honda Accord Hybrid? Unfortunately, we couldn’t cover all of the aspects in which the Accord Hybrid shines over the Camry Hybrid. 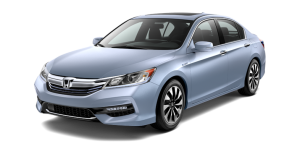 The Accord Hybrid also offers better safety, a powerful powertrain configuration and more standard features than the Camry Hybrid. Come see for yourself what the Accord Hybrid can offer by visiting your nearest Central Illinois Honda Dealers location. You can also contact us online to learn more about financing a vehicle or our current offers.